I really have enjoyed my forsythia shrub. It's been a pleasure growing. And easy too. It's alive with spring color. Only bad thing is it is growing so fast I cant keep it trimmed back. Golden Bell Forsythia - Forsythia intermedia. The Golden Bell Forsythia is a bush that flowers in the late winter to early spring with small, bright yellow flowers. In summer the green leaves appear, which turn to a golden yellow in the fall. These fast-growing bushes reach a height of 9-11 feet. Used as a border or a living fence, they grow in zones 5-9 in well-drained clay soil with full to partial sun. Golden Bell Forsythia a hardy, deciduous shrub, which displays beautiful, bright yellow color every spring. 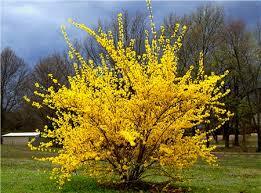 Forsythia is an excellent choice for those in more southern areas. Forsythia features many long, woody branches, which make for a more artistic and rambling bush than more staid examples such as boxwood or privet. 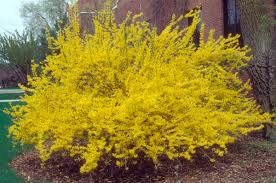 However, forsythia bushes are just as useful as a green privacy shrub. The golden bell forsythia has the botanical name Forsythia intermedia and is a medium sized that is low maintenance that does not need trimming and is fast growing, which is perfect for landscaping applications. This shrub has small to medium yellow flowers that bloom before the leaves form. These blooms last for between two to four weeks. After the flowers die off, then the shrub is filled with green foliage that can make a beautiful border shrub in yards and outer edges of gardens. The shrub will produce more blooms when it is located in a sunny area. The bush features long thin shiny brown branches. Golden Bell Forsythia is used for hedges, walkways, driveways, and landscaping. The flowers can be cut and put in a vase with warm water, and they will last for an extended amount of time. The golden bell forsythia was named after William Forsythia a Scottish botanist. This shrub is in the Victorian language of flowers as symbolizing anticipation. The flowers can be found in floral shops to add to bouquets. The forsythia flowers are edible and can be used to make teas or syrups and decorate cakes. This is also a common herb in Chinese medicine used for colds, bronchitis, and allergies.